Wittmann Textiles Company: Wittmann Textiles Company 60 years and counting! Time to celebrate 60 years in business at Wittmann Textiles Company. Our family takes time to consider this milestone that our loyal customers made possible all through these years. We just want to express our deepest gratitude and want them to know that each customer/friend is unique in our eyes and we cherish each of you. THANK YOU! We are so very thankful that the same people have made our Tee-PJ nightshirts the whole time since 1955. 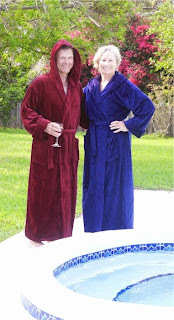 Our Premium quality ring-spun 100% cotton terry cloth robes have been in our line for over 30 years. They are thicker than department stores and many customers have told us that it was such a nice surprise to get quality above their expectations. It is in our best interest as a company to provide you with premium quality and comfort and hope that when you need another robe in like 10 years, you will think of us. We love hearing from our customers that they are treating themselves or a loved one to something that will bring years of comfort and pleasure. Our lives get so very busy and it is nice to come home and just add a layer of softness and luxury to our lives that only all cotton nightshirts and thick luxuriousTerry Bath robes can provide. Whether it is stepping out of the shower or running to the house after being in the pool or hot tub, this is the ultimate in resort living at home. Our robes have been featured in many popular television shows because of the instant premium, luxurious first impression they make. 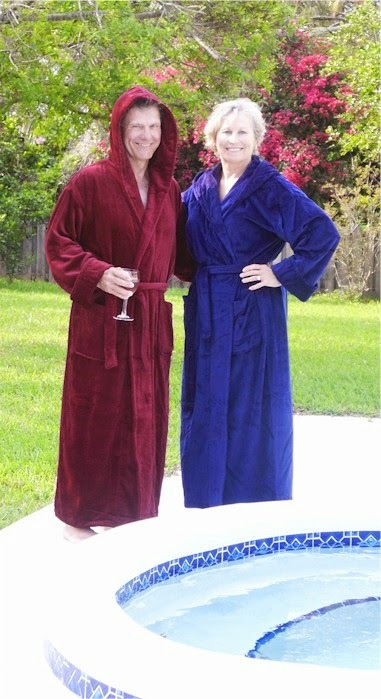 Whether in a setting in Africa at a luxury couples spa for a comedy feature film or at a ski chalet in Lake Tahoe coming out of the hot tub with gorgeous ladies, it is all part of a day’s work for these hard working, absorbent 100% cotton terry bathrobes. We at Wittmann Textiles Company have been working diligently on a new look for our website that will make it much easier to view on any device you choose from a cellphone on the run to enjoying shopping with your tablet or wide screen monitor. Again, thank you for shopping at our family store, where our customers are never a number! Your privacy is important to us, we never sell you personal information - our policy and promise since 1955. You are welcome to opt in or out of our catalog semi-annual mailings. The only way you can get on our quarterly emailing list is to sign up on our Homepage. We do not spam our customers with email product advertisements. A national mail order and internet company in Hobe Sound, Florida, Wittmann Textiles Company family owned and operated continuously for 60 years. Offering made in the USA and other high quality sleepwear selling directly to the consumer at the best possible price. Wittmann Textiles Company, headquartered in Hobe Sound, FL, advertises in Smithsonian, Elks, Sierra, National Review, and others. Wittmann Textiles Company offers great personal customer service and all products are backed by a 100% Satisfaction, Money-Back Guarantee. For more information, please visit http: http://www.wittmanntextiles.com. For a free catalog call 800-890-7232.